Growing up in Ayrshire in the 1950s, Lapwing was a familiar farmland bird. While Chaucer, 'false lapwynge, ful of treacherye', for some reason associated deceit with the Lapwing, I associate this beautiful bird with its joyous display flight in late spring and early summer. 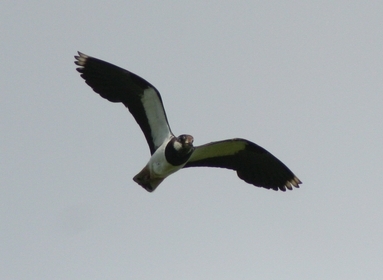 Although from a distance the Lapwing appears black above and white below, close to, its true colours are revealed. The upperparts are an iridescent dark green and purple. Another name of Lapwing is indeed Green Plover. The breast and cheeks are white and under-tail coverts are orange-brown. The legs are pink. Both males and females are similar. Both have the crowning glory of a wispy crest. The male's crest is longer and they have blacker breasts and whiter faces. All in all, they are an attractive bird. In flight the initial impression is a slow wing beat that does not appear enough to keep them aloft, but in the spring males put on adramatic aerial display, withzigzagging flight, tumbling rolls and almost suicidal like dives as they hurtle towards the ground. This mastery of the air, marking their territory, is accompanied by their piercing 'peewit' call, which gives them their other common name. Females with care can be spotted on nests which are simple scrapes on the ground. By late spring the eggs hatch and the fluffy chicks literally run from the nest, venturing out to forage for food. If the nest or chicks are threatened by crows or gulls, the feisty Lapwings will 'mob' these predators - attacking them in an effort to move them from their breeding territory. But the Lapwing is a far less familiar farmland bird now compared to the 1950s. The species is red-listed as a bird of conservation concern in the UK. From data collected by the British Trust for Ornithology, the UK population of the Lapwing fell by at least 40% between 1970 and 1998. The problem does not seem to be increased mortality of the adult birds but rather the failure to successfully rear young. This decline has been largely caused by the loss of mixed farming and the intensification of grassland management. Declines in the west of the UK are leading to local extinctions. Conservationists believe that as well as habitat loss, predation of nests by crows and other predators is a major factor limiting Lapwing recovery. Here on Arran in 2014, there was only one confirmed breeding area and one possible breeding area. Research suggests that these birds require two conditions to raise young successfully, short vegetation or bare ground for nesting and rougher pasture for the hatched chicks to forage and hide in. 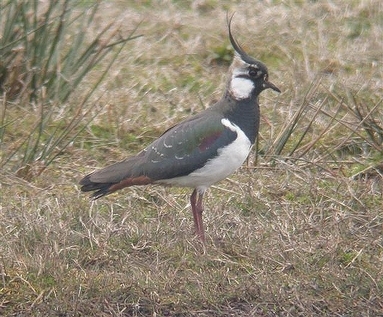 Lapwings breed between mid-March and July. They nest on spring-tilled arable land or on short grassland with a low stocking rate. Later, arable nesting birds often walk their chicks on to grazed pasture to feed. 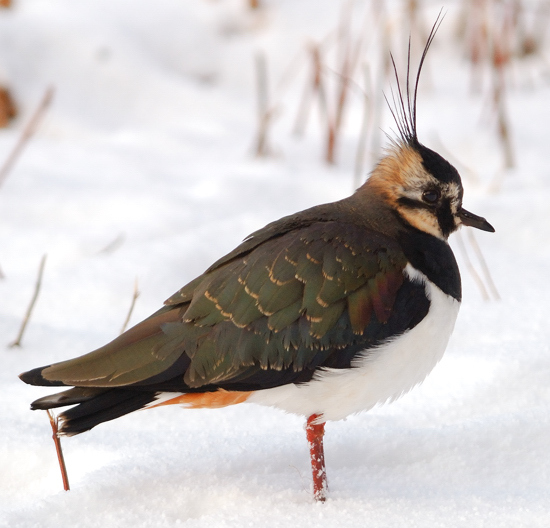 Lapwings feed mainly on earthworms, leatherjackets, insects and their larvae. They generally feed where they can find lots of these, such as in grazed pasture. Wet grassland is a particularly important source of food. Birds start to return to breeding grounds from mid-February. Display activity usually starts in February and March with the main egg laying period in April, but depending on habitat conditions can extend to early June. The incubation period is 26 days with chicks appearing from April to early July.